Another one of these games please. More big time games this weekend for your viewing pleasure! There will be some huge SEC matchups with highly ranked teams. The Michigan Wolverines will finally stop avoiding the Scarlet Knights after 135 years of ducking Rutgers, the Nation's longest winning College Football program, as they face off in New Jersey on Saturday night. There will also be a big barometer game between Notre Dame and Stanford, the outcome of which should help us better understand how the Pac12 stacks up with some other conferences. Minnesota at Green Bay - Both of these NFC North teams had big program wins last weekend. The Vikings won big on the debut start of their first round QB, Teddy Bridgewater and the Packers returned to playing like we all thought they could in a lopsided win. Unfortunately for the Vikings, Bridgewater's potential is already in question as he has been dealing with a sprained ankle on a short week and will be a game time call tonight. Arizona at #2 Oregon - The Ducks look to prove themselves against a team that might actually play as fast as they do. Arizona hasn't looked nearly as impressive over 4 quarters in any game this year as the Ducks have but maybe they can change that tonight? #6 Texas A&M at #12 Mississippi State - (ESPN) These teams play just like one another and Kenny Hill looks like a younger Dax Prescott. Prescott might be more athletic but they both have fantastic arms and use their escapability as a weapon. The winner here will be the team who can contain the QB and cover the WRs. #20 Ohio State at Maryland - (ABC) This is a big one for both schools as Ohio State wants to prove that they are still the top dog in the B1G and Maryland wants to show that they can hang with ranked teams, something they haven't done in a long time but with 18th year QB CJ Brown supposedly returning from injury to lead the Turtles it could be a great game. SMU at #22 East Carolina - (ESPNU) If you like points, Eastern Carolina led by Heisman hopeful QB Shane Carden might put up 150 against a pony defense that has tried two tactics this season, shrugging indifference and outright giving up. Neither of which has done much to stop opponents and the Pirates have a habit of racking up TDs lately against even some formidable foes. Florida at Tennessee - (SECN) Made the list only due to talent on hand and notable rivalry, the outcome is largely inconsequential. #3 Alabama at #11 Ole Miss - (CBS) Am I the only one that feels like this game won't even be close? We've all been congratulating Alabama's QBs on their brave performances but they have also been the only weak spot on an almost impossibly talented team this year. If they have even a decent showing against and Ole Miss team that has some great talent in spots, they will win by at least 20. #4 Oklahoma at #25 TCU - (FOX) TCU has had a spunky defense this year but it will be a tough challenge for them to stand up to the enormous Sooner offensive line. If they can get some pressure off the edge and somehow jam up the running lanes it will be a lot of fun to see Oklahoma QB Trevor Knight try to win one through the air. #14 Stanford at #9 Notre Dame - (NBC) Both teams look and feel like Top 15 squads right now and a big win here will help propel either into the upper echelon discussion but a close game will only add to the confusion of ranking the Pac12. Also look for Notre Dame's QB Everett Golson to put up a highlight performance against a stout Stanford defense. 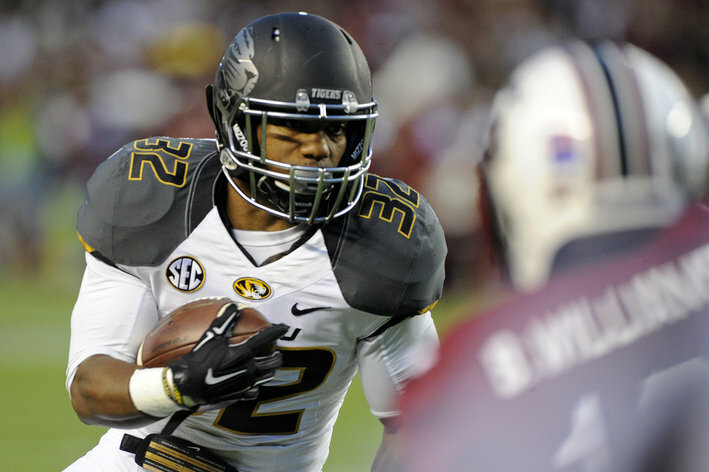 He could really make a leap in the Heisman race with a big game on Saturday. 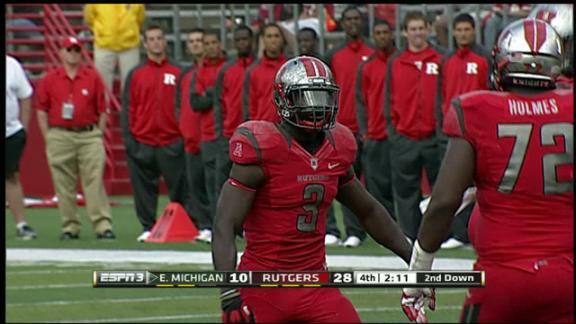 Michigan at Rutgers - (BTN) Could the Scarlet Knights put the nail in Michigan's Athletic Dept coffin? There have been student protests on campus in Ann Arbor this week as the kids are fed up with the team and the staff running the show there. Those kids decided to go to Michigan to see a winning football team and now the just have to go to class and watch loses to Utah and Minnesota. I wouldn't be happy either. Rutgers would be 5-1 and in great position with a win on Saturday night before a bye week and a game at Ohio State on the horizon. #15 LSU at #5 Auburn - (ESPN) This one is going to go a long way to sorting out the SEC. Both teams are loaded with talent but LSU's offense has largely been invisible against teams that play defense while Auburn's offense is a threat to anyone. Matching up against Auburn's QB Nick Marshall is tough for anyone but the team speed on LSU's defense might be the most difficult challenge for him this season. Arizona State at #16 USC - (FOX) If ASU's QB Taylor Kelly is back this should be an interesting game as both teams look talented but have had devastating loses already this season. If he doesn't play, USC needs to win this one going away. #19 Nebraska at #10 Michigan State - (ABC) Michigan State started the season as the favorite in the Big Ten and still hold a lead on that "title" despite a hard fought loss to Oregon in Week 1. Nebraska has looked shaky at times this year but hasn't lost yet despite a scare against the ever-threatening McNeese State somethingorothers. This has "Heisman Moment" potential as Nebraska's all world RB Ameer Abdullah who is leading College Football in rushing yards at this point in the season faces a very tough Spartan defense. Look for MSU's offense to surprise some people as they are a big reason why Michigan State wins this one. St. Louis at Philadephia - #TheNickFolesExperience continues as the Eagles take on a Rams team led by Austin Davis. For those of you who do not follow the walk-on scene at Southern Miss, Austin Davis was a walk-on QB at Southern Miss before going undrafted in 2012. He is not the starting QB filling in for injured QBs Sam Bradford and Shaun Hill. The biggest thing to watch here is Philly's running game against St. Lou's front seven. Both units are expected to be difference makers for their teams but Eagles RB Lesean McCoy has looked terrible since getting walloped against the Redskins and totally cleared to play after looking like a surefire concussion victim. Something doesn't add up here. Chicago at Carolina - Does Carolina even run the ball this week? All of their RBs seem to be on permanent injury these days. What kind of team is Chicago this year, they look like contenders one week then above average QB Jay Cutler morphs into smoking Jay Cutler throws a bunch of interceptions and sulks all over the sidelines spreading indifference and malaise through the whole team. Tampa Bay at New Orleans - Are the Saints that bad? We have seen that the Bucs have enormous potential to be that bad then they go and beat the Steelers last week and TOTALLY REDEEM themselves. Who is the worst in the AFC South? Could it really be the Saints? Buffalo at Detroit - Let the Age of Kyle Orton begin! Could one man be more suited to lead the Buffalo Bills into battle? Probably be but he's the best they have, so they are going to roll with it. If Calvin Johnson doesn't recover from his injury any more this week I wouldn't actually be surprised if the Bills win this one. Their defense is legit and if Orton is able to make even a few plays where Manual made mistakes the Bills are a good offense. Baltimore at Indianapolis - Andrew Luck is more or less much watch TV. He is by far the top up and coming QB in the league and with all that's been fretted about over Tom Brady's impending demise after one bad game, attention naturally turns to who is next. The answer is Luck and the Colts need to do some work to surround him with talent, namely on the O-Line, but they have a bright future. Arizona at Denver - The surprising Cardinals are one of two unbeatens but they are traveling to play a pre season Super Bowl favorite Denver Broncos and P.E.Y. at Mile High. The Cardinals are thin all over but keep winning while it's a great story I don't see it continuing past this game. Kansas City at San Francisco - The Chiefs and 49ers both had big time wins last week and look to continue the good vibes for another week. The Chiefs have looked surprisingly threatening for a team most people had written off or lucky after they shocked everyone last year in Andy Reid's first as Head Coach. Cincinnati at New England - The Bengals are undefeated and the Patriots are coming off of the worst loss of the Brady & Belichick era. (Yes that gets a full ampersand). The Bengals are traveling to New England to play the Pats in Prime Time. As much as Brady is known for really bringing the intensity for Prime Time games I have to imagine he is burning with the fire of a thousand suns to avenge himself in the eyes of everyone southwest of whatever town in Connecticut decided that they were going to be Giants fans this season if the Pats aren't going to be good. Also the Bengals are pretty good so this has great potential to be a tremendous game.